Bringing Back The Daakness: In Conversation With Andrew James | Warped Factor - Words in the Key of Geek. Andrew James is the Editor at Titan Comics, charged with bringing the Doctor Who comic-books to the world’s geeks. Tony caught up with him and asked him about bringing Abslom Daak back to a waiting world. Why bring Abslom Daak back? Why now? And most particularly, why pair him up with the Eleventh Doctor? 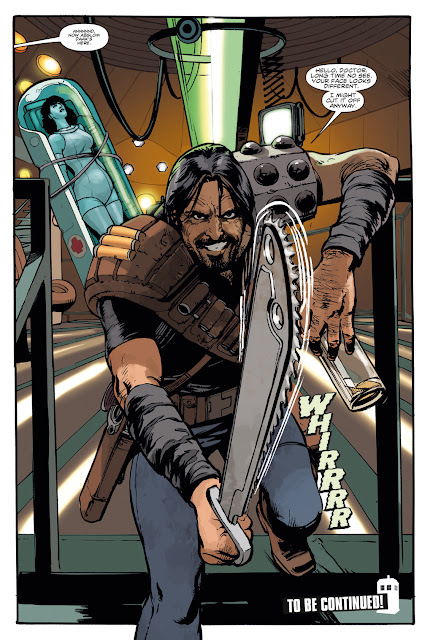 It was primarily because Si [Spurrier] and Rob [Williams, the writers of this year’s Eleventh Doctor arc] were super-keen on including him – and that Derek Ritchie, the BBC producer who does our comics approvals, is a supermassive Abslom Daak fan, so was cheering our corner from the off! What about that pairing and the timing made you think it had to be done? Daak makes for a great foil for the Eleventh Doctor – on the surface, they seem so different, but the pair share a lot of characteristics. There’s also the fact that by opposing a character who prides himself on his complexity, like the Doctor, with a character who has a straight-line simplicity to him, like Daak, the Doctor is forced to bump up against some uncomfortable truths about himself. It’s usually through Daak’s unimpressed commentary forcing the Doctor to acknowledge his occasionally bald manipulations of the people he travels with. And ‘uncomfortable truths’ is a key theme for this second year of Eleventh Doctor stories. Finally, as we’re also wrapped up in the secret goings-on of the Time War, Daak is a terrific source of fascination – as a big chunk of his identity is sealed away behind the Time Lock. What does a Dalek-Killer do when there aren’t any Daleks anymore? That’s another of the things the team is exploring. Daak has a long and fairly complex history in comic-books. 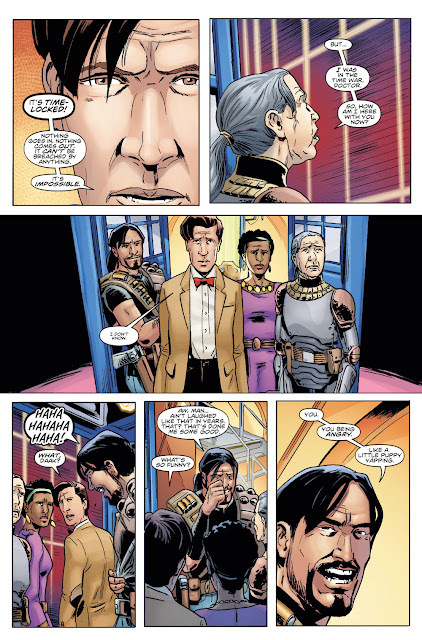 How reliant are you, including him in an Eleventh Doctor story, on readers knowing much of his backstory? I always approach backstory and continuity as a bonus for long-term readers and fans, not a barrier-to-entry for those coming to a story with no prior knowledge. For Abslom fans, he’s back, in his prime, and all of those various past stories happened – and there are plenty of Easter eggs or outright acknowledgements of his legend in the series. To new fans who’ve never read an Abslom story before, all you need to know about him for the story at hand is contained in these issues. Hopefully, his appearances inspire our readers to seek out all the classic stories from Panini and dig in to some truly great comics from the past! Was there much wrangling involved, getting the rights to use Daak, or was that plain sailing? There was a reasonable degree of wrangling! I’m terrifically grateful to the fantastic team at Doctor Who Magazine, and Panini, for allowing us to take Daak for a spin this year, and add some new wrinkles to his legend. We’ll be passing the baton back to them at some point in the future – though with our story still unspooling, I’m obviously not going to say when! The Then and the Now is a crowded story – The War Doctor, The Then and the Now itself, The Squire, images at least of the Master, Sontarans, now River Song. 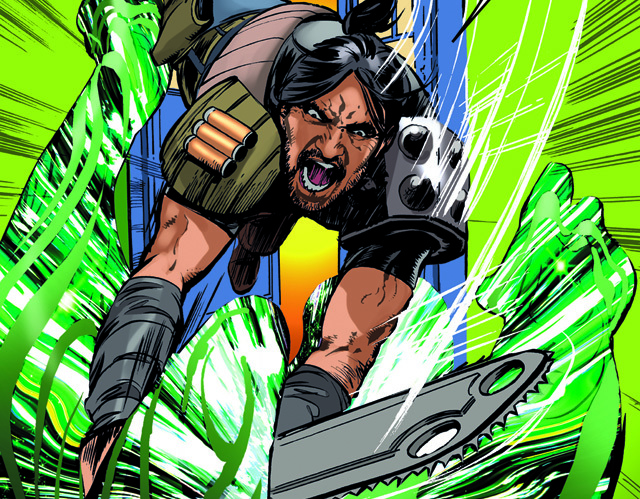 What special ingredient does Daak bring to proceedings? He’s the guy who says what the Doctor can’t, the yelling id, the man with a chainsword and a dubious moral code… but the special ingredient that Daak brings to the story changes across the course of the year, as you’ll see towards the end of our second act. He’s also a violent breath of fresh air! You can throw him into any room and not quite be sure how he’ll act, which is always good for shaking things up. And he’s a good man to have on your side, however temporarily, when the odds are long and stacked against you. Fans are more used to Daak being front and centre in the adventuring – there was an issue of The Then and the Now where he disappeared entirely for the majority of it (another product of a crowded TARDIS to some extent). How do you think The Then and The Now will stack up against what older fans think of as classic Daak stories? Well, it’s very much still the Doctor’s book, so Daak is part of the TARDIS ensemble, but he’s got a number of important roles to play – including some quite surprising ones. Daak is someone who doesn’t want to think about – or admit that he has – hidden depths, but those are going to come to the forefront later in the year – and surprise a lot of people, I’m sure. We wouldn’t be including Daak if we didn’t think there were new stories to tell with him – as for how it stacks up against his classics… that’s for the readers to decide when we’re done! 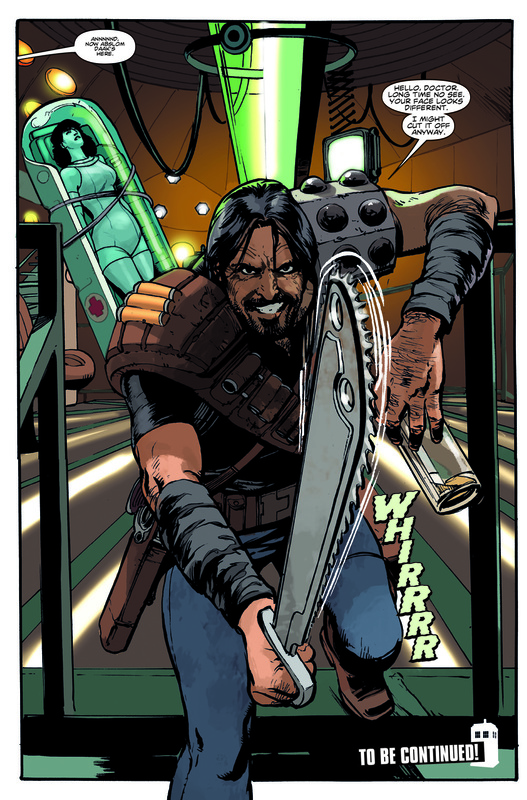 And one cheeky one – there were attempts in the past to shift Daak out of the Who universe and into his own spin-off comic-book. Might we yet see that happen under the Titan banner, if, say, he’s massively successful in The Then and the Now? In which regard – what has audience reaction been like from older fans and the new generation? Well, the audience reaction has been lovely, so never say never – but Abslom is on loan to us from Panini for this particular story, so we’d need to work something else out. I think this year has been, and will be, a great advertisement for his continuing relevance as a character, but he’s a character who is at his strongest as part of an ensemble, I think. Especially an ensemble that thoroughly disagrees with his often-fatal way of dealing with things! 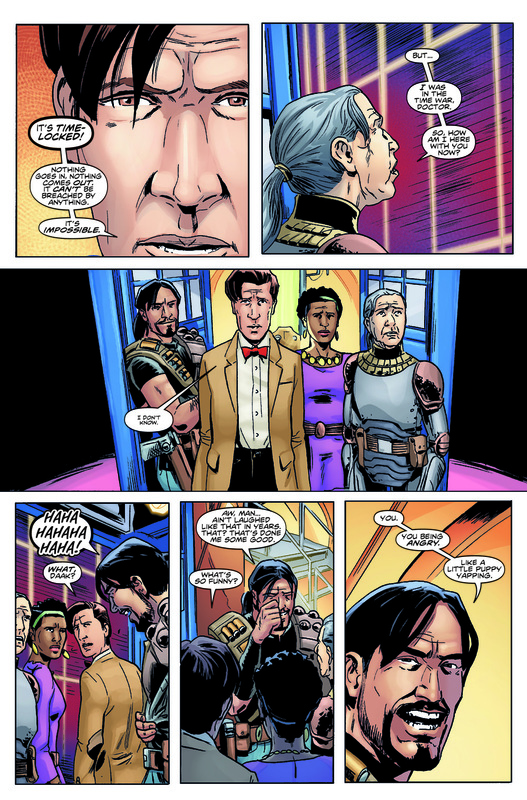 If nothing else, we’re tremendously grateful and delighted to have had the chance to put him through his paces in a modern Who epic, and however and whenever he leaves the series, you can count on him being set up for future comics adventures wherever he lands. Andrew James, thank you very much.